Today you'll find a new review in my ”Review and Swatches” section here on the blog. 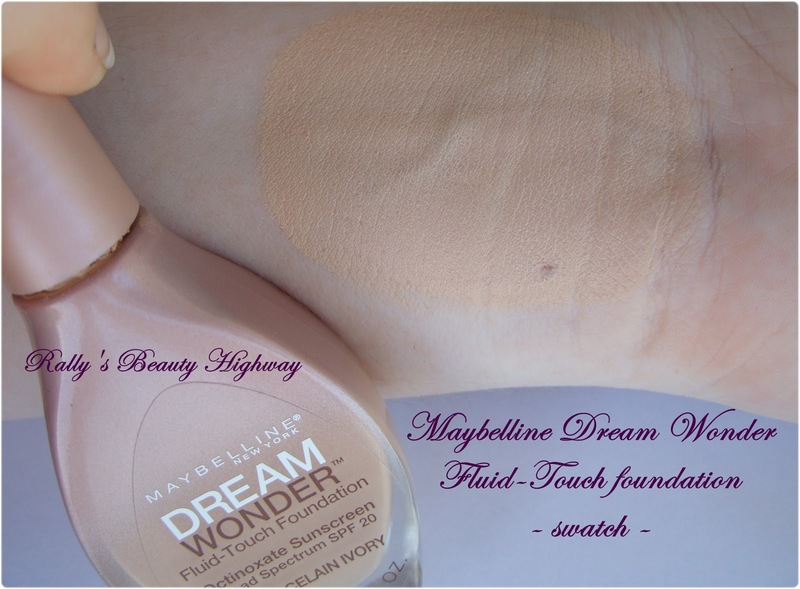 I am reviewing for you the new Maybelline Dream Wonder Fluid-Touch foundation. For me, finding a good foundation is quite a challenge, considering my fair complexion. In the same time, I have to be very careful, because I don't want to look like a ghost, nor like a ”Tiki mask”, not to mention that my new sensitive combination skin requires much more attention than before, when I had a normal with dry tendencies skin. Clarifying that, I have to mention that in terms of foundations, I had a few pleasant surprises both from drugstores and dermatocosmetics brands. I will review those particular foundations in the future. 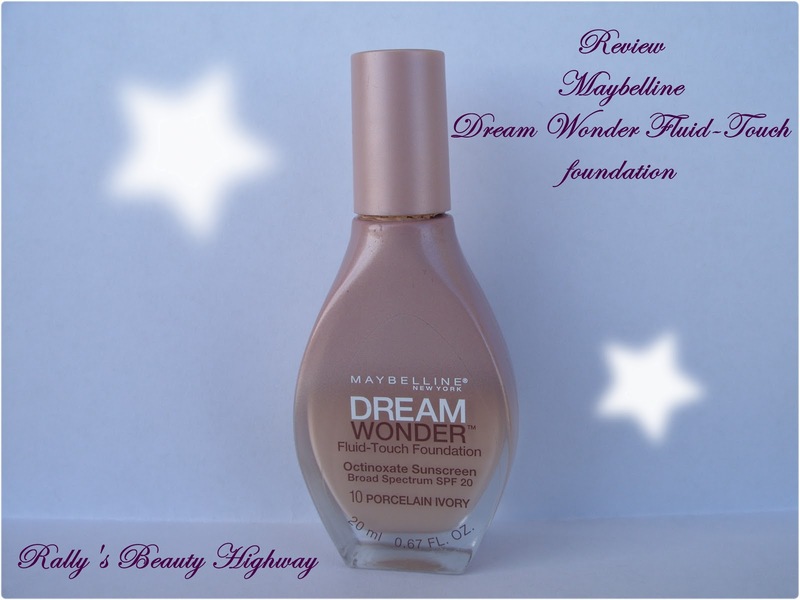 I ended up buying the Maybelline Dream Wonder Fluid-Touch foundation because I was drawn by the element of innovation and surprise that this product brought on the market. I bought it from my local Wal-Mart and I paid $8.94 (+ tax). 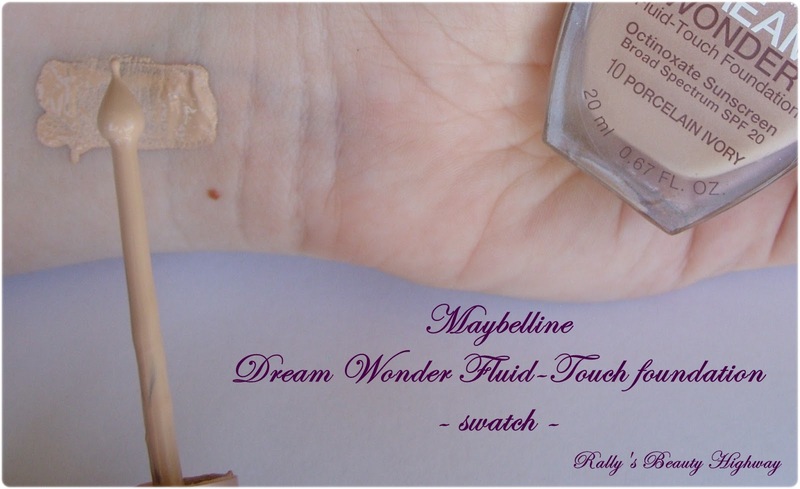 As you can see, Maybelline Dream Wonder Fluid-Touch foundation comes in a hard glass bottle and has 20 ml or 0.67 FL. OZ.. According to the code on the back of the bottle - the product has been manufactured in May 2014 and has a general shelf life of 36 months. Inactive ingredients: Dimethicone, Cyclohexasiloxane, Isododecane, Alchool Denat, Vinyl Dimethicone/ Methicone Silsesquioxane Crosspolymer, Phenyl Trimethicone, Acrylates/ Polytrimethylsiloxymethacrylate Copolymer, PEG -10 Dimethicone, Disteardimonium Hectorite, Water, Disodium Stearoyl Glutamate, Propylene Carbonate, Aluminium Hydroxide; may contain: Titanium Dioxide, Iron Oxides. The innovative element comes with the packaging of this foundation - the hard glasss bottle has an ergonomic design which allows you to store and carry it easily, but what makes unique this foundation is its exclusive dropper - the tear drop-shapped applicator. The texture is a fluid one. Normally I do not necessarly mention this is a review of a foundation, but the smell I did not like it at all. I was not expecting a roses and flowers scent, but this product has quite a noticeable alcohool smell. This new Maybelline foundations comes in 12 shades, which is a good thing to see that they tried to cover as much as possible from all the ranges of skin complexions. I purchased the shade ”10 Porcelain Ivory” which is the fairest of them all (like me). I was debating weather to buy this shade or ”15 Ivory”, but I was affraid that the Ivory will look a little darker on me, and with my skin tone every darker drop is visibly right away, so I ended up purchasing the first one. Most probably, my perfect shade will be a mix between these two. Anyhow, this chosen shade seems to be working ok for me. When I was using this fondation, I had to shake it well, due to its fluid consistency and separation of formula, unscrew the cap, allow the foundation to drop onto fingertip and apply it to my face. I must say that I am not a huge fan of the ”tear drop” applicator/ dropper. I prefer better the pump applicator, which allows you to apply the exact amount of product you need. 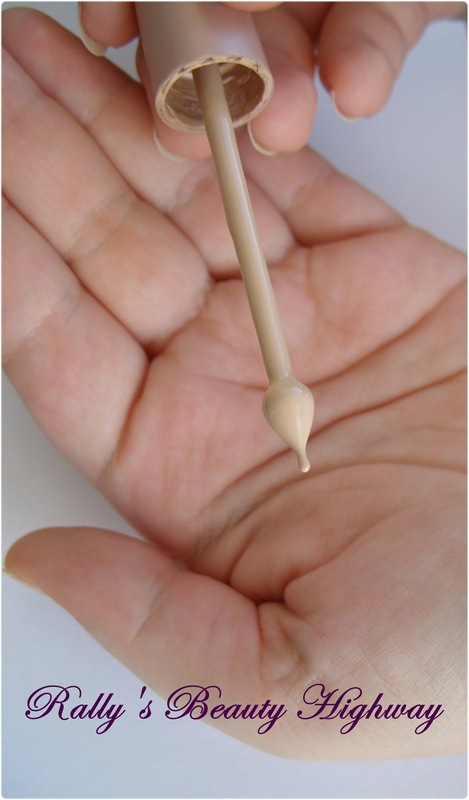 This particular applicator, most of the times, did not drop the foundation, I had to rub it to my fingertip; also as the foundation's wand goes deep into the foundation's formula, when you take it out to apply the foundation onto your fingertips, it comes out with a certain amount of foundation. When you put the wand back into the bottle, that tricked amount of foundation builds up on the bottle's ”neck”, being messy. The foundation gave me a small to medium coverage for my combination skin. It glides smoothly when applied on the skin, blends well either using fingers or a brush and gives me a nice, subtle ”no makeup” makeup look. You can build it up without looking cakey or have that wierd ”mask” feeling. It worked ok set up with a mattifying powder, without it my oily zones (T- Zone, chin), started to shine in about 2-3 hours after application. Although on me this foundation looks ok, I consider it more suitable for a normal skin, because it does not offer the complete coverage that I need to feel confident in it. Moreover, this is not a transfer resistant foundation, it will stain the objects that your face will come in contact with like the cell phone, regular phone or your shirt's collar. Also, I want to mention I was glad to see that this foundation has SPF 20, which is such a great thing to complete your already applied SPF face cream in the fight against sun damage. This is a big plus. REMEMBER: Even though this foundation has SPF 20, DO NOT FORGET to apply your daily SPF moisturizer, because applied alone, this product does not protect you completely from the sun, but applied in combination with a SPF moisturizer makes quite the team. The presence of the Alchool Denat in this product's composition did affect me a little. Having a sensitive combination skin is not easy. As I am using and testing more and more cosmetic products, I discover that my skin tends to react differently when it comes to products that contain Alchool Denat. For exemple, I used face creams that had this ingredient and my skin tolerated the product, there were other cases when I felt my skin dry or I broke out, or I felt a sensation of itchiness. Talking about Maybelline Dream Wonder Fluid-Touch foundation I felt my skin a tad bit dry, but no other reactions. If you have combination skin or acne prone skin, I woulnd't recomment purchasing this product. Personally, I had a love-hate relationship with it, there were aspects that I did like, but there were certainly aspects that I did not like at all. I incline to say that this foundation will not be repurchased. I hope these information were useful to you! Did you try the new Maybelline Dream Wonder Fluid-Touch foundation?